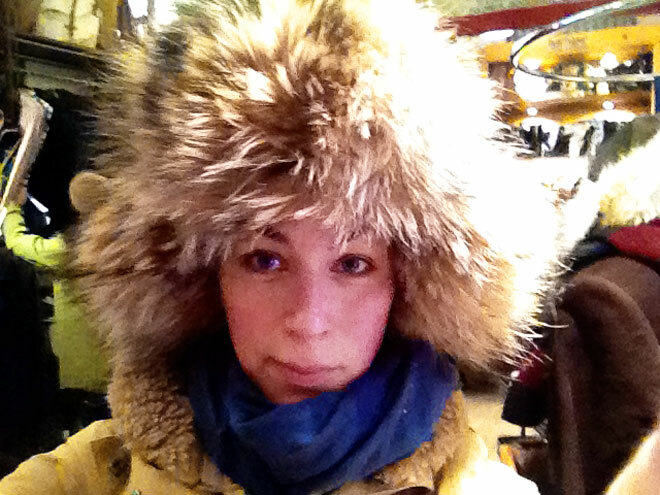 Oh my – today I fell in love with a hat but the wrong kind and now I don’t know what to do. I have been wanting a large gorgeous hat for a while and in this lovely vintage store this baby came to me as in a dream. The only problem is – it’s made of fur. My intestines then start to scream – don’t do it! Fur hell no- but then I’m thinking that it is vintage and that the animal is already long dead. I’m a vegetarian who eat fish. I like animals. I don’t like animal cruelty but when it comes to vintage fur I just don’t know anymore cause for me it’s not like buying a new one. I haven’t bought the hat but still thinking about it. Yeah call it double morals but I don’t think it’s a clean yes or no. In a way I kind of embrace the ones who says buying second hand fur is a tribute to the animal and the life it once had – the damage is already done. On the other hand in the streets no one knows it’s vintage and for the thing that making fur even more fashionable by wearing it – It’s maybe not a good idea. But should you then even wear fake fur? Sometimes it’s hard seeing the difference anyway. And what about downs, leather, and meat? Where do we draw this line? How do we know we are making a good choice? And is it the same for all animals – I mean I don’t think it’s ok with a tiger hat – vintage or new. And then I even heard that making fake fur is really bad to the environment because what it’s made of and the process making it. But what do I really know – there are so many lobbyists saying one or another thing. I know this issue raises a lot of feelings but please I want to hear – what do you think? And have you seen any fake fur ones out there that looks like this one ? Even if it is vintage it brings BAD karma to your household, the animal did died even if it was a long time ago and probably he or she suffered from it. The killing technics were even more brutal back then tho they haven’t improved yet. I saw a documentary about ming fur and they remove the skin before killing them and they cut their little paws-feet so they cannot run away. IT is awful. Isabelle it probably look frakking awesome but in my opinion you should not use it. I am a ovolacto vegetarian, I don’t own anything made of leather or animal skin, I don’t eat any dead meat and sometimes even I (strict as I am) crave fish for example but I don’t succumb to the temptation. It doesn’t matter what the experts might say, what matters is my personal opinion and my believes. I believe that I will not ingest something that died with fear and wear something that screamed his little lungs out while someone kill him so I can look nice. For me it is a matter of kindness with the helpless animals, we are responsible for our footprint in this planet and I made a clear decision to not harm not even a fly. From the bottom of my heart I can tell you that I will look nice but at least for me it will be a constant reminder of a meaningless death. Mink* and sorry for my bad english I was writing so fast that I did not paid attention. Även om djuret redan är dött så blir även ett vintage pälsplagg en stark negativ symbol tycker jag. De som ser dig kanske tror att du tycker det är ok med all sorts päls. Så jag tycker du gör rätt i att inte köpa den. Som ett statement. Alltså, jag köpte i år en “vintage” päls på tradera och lite dåligt samvete fick jag nog. Tills jag såg att den var handgjord och forad med pjamasflanell tyg. Antagligen gjord av någon liten dam som kunde konsten att sy. Jag har inte fryst en enda gång i år. Skulle dock adrig köpa en “ny” päls. Och det där med fuskpäls. Det är plast. Vad är värst för miljön? Sen vet ju jag också att ens eget samvete oftast går före miljöns “samvete”. Hoppas du kan bestämma dig med en bra känsla i hjärtat! Another veggie and fish-eater here. I can’t really see the difference between using leather shoes and fur. Animals dying either way, no? And since I DO wear leather shoes for lack of good alternatives, I would have gotten the hat. I wouldn’t have bought a new one (don’t ask me why since I buy new shoes…) but vintage would work for me. Look at these pictures from Siberia. They are wearing fur. Right or wrong? I have a similar second hand fur hat as the one in your picture. Living in Helsinki that is the best winter hat I have ever had. Not only warm but the fur also stops the snow from coming in my face all the time. Eva makes a good point. So we can identify two situations 1. wear fur for fashion and 2. wear fur because the winter is so so harsh and you don’t have any other alternative. If you use it just for option number 1 then I believe it is not ok at all, but if you are using it because you live somewhere where the winter is so harsh and there are no other options available for you, then it should be an exception. I appreciate your good heart. The trouble with the argument is if you follow it through you wouldn’t be able to even walk on the sidewalk….because of how awful the process is to get that cement….and on and on it goes. Balance is difficult to achieve. I’ll bet the person who owns the shop could benefit from the sale of that hat…… Good luck figuring it all out! Thank you Sue Mey for interpreting my post! Sometimes it’s complicated for me to be clear. Well allways good to think about what you are doing anyway. The difference between fur and leather is that in most cases leather comes from animals that were killed for meat. Fur doesn’t came from animals that were used in other ways, for example the racoons that are being skinned alive in China for fur. Isabelle, I know what you mean about vintage fur. But what you say, people on the street don’t see it’s vintage. The more fur is visible on the streets, the more people will be ‘inspired’ to buy it.